Posted on October 17, 2014 at 7:56 am. We will have the nursery ‘Open to the Public’ again this weekend -Saturday 18 and Sunday 19 October – 8.00 am to 3.00 pm. We have had quite a number of folk wanting to visit over the past weeks and so we have had lots of visitors. 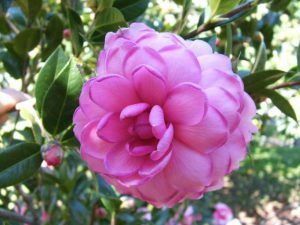 The weather has been beautiful – although we desperately need rain – and the camellias, especially the japonicas, are putting on new growth, and are looking fantastic. We have several hundreds of both sasanqua and japonica in 140mm pots that are sale ready. These plants are 12 months old and so have established roots, and vary from 20cm to 60cm depending on the variety and the normal growth habit. We have over 150 different varieties, so if you are wanting something in particular, please ask. Now is a great time for planting, although last month was better – before the plants started new growth. Be gentle with new growth as it can be quite fragile until it hardens off. Do not over-fertilise, which although tempting to do, it is likely to burn new roots and foliage. There should be enough active slow release fertiliser, in our plants at least, to keep going until the end of the year. When planting, make your hole twice as big as the plant rootball. You must have a well drained soil – water must drain from the hole freely and not stay for days. Add any composted material that you want to add to the backfill soil, including any well rotted cow, horse, sheep, alpaca, goat manures (avoid fresh chook manure and mushroom compost as these are inclined to be alkaline and we need an acid soil for camellias). You can also add coarse sand or fine gravel to the backfill – this aids drainage and lifts the plant. This is especially good if the area in damp. 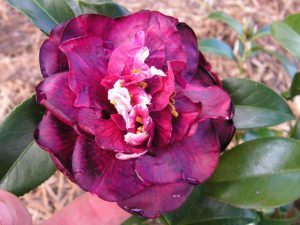 Camellias need a well drained and acid soil. They will not tolerate wet and boggy soil. Keep the pH to below 7 and best 6 to 6.5. Backfill the hole – and our recommendation is to raise the plant proud of the surrounding soil level so that when the newly dug soil settles, your camellia does not find itself in a hole. 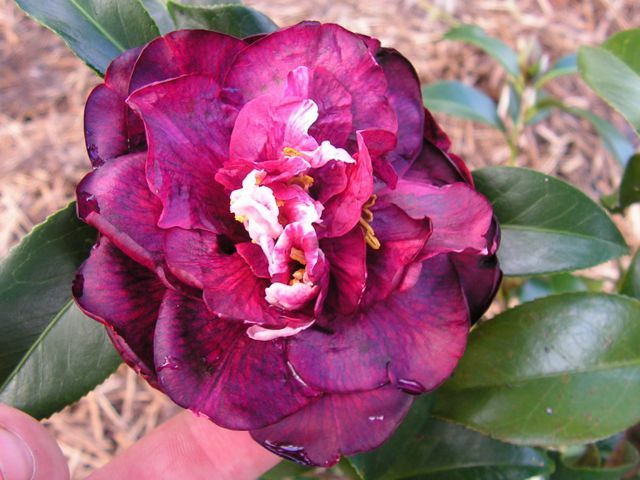 Water in your newly planted camellia and mulch well to about 10cm. This keeps the moisture in, stops the top soil from drying and suppresses the weeds. Water well – like a bucket of water – once a week. Remember, sasanquas can take and perform at their best in full sun. They can also take part shade and be perfectly happy. For SE Queensland where we are, we recommend that japonicas should have at least part day shade. We also recommend morning shade – especially in winter, as the flowers will burn. 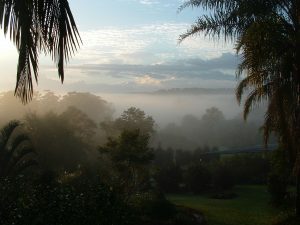 It is the sun on the dew on the flowers in the morning that burn the flowers. Our morning sun is strong. Particularly protect all formal double flowers. The plants themselves handle the sun well enough. We will recommence our mail order in December when the new growth hardens sufficiently to cope with packing. Things to do, plants to plant, cuttings to pot, little plants to make into bigger plants. Time to go. Come and visit – we have lots of beautiful camellias. Posted on July 27, 2014 at 7:50 am. We are open again today, Sunday 27 July 2014. And what a beautiful morning it has started off. We still have many different varieties of camellias, sasanquas for the sun, japonicas for those part shade positions, and of course the hybrids and species. Hundreds of plants, and about 200 different varieties mostly in 140mm pots (that’s a 6inch pot) with plants between 30cm and 90cm depending on the variety. Lots of camellias still flowering, come and wander. We also have many vireya rhododendron available – some flowering now. Posted on June 28, 2014 at 9:53 pm. Just a reminder that we will be at the Randall Studio, Mt Coot-tha Botanic Gardens in Toowong, tomorrow, Sunday 29 June for the annual Queensland Camellia Society show. We will have lots of plants there for sale. If we don’t have a particular variety there, we will be at the nursery the following weekend Saturday 5 and Sunday 6 July – ask – we have about 200 varieties of camellias available. Hope you got some rain..